So this got me thinking about an arena that implemented that building jumping technique, which is basically a grid of buildings that cars can battle through. A ramp can launch the car to the corresponding parallel buildings, and is also used to launch the car into the city. The turns are used to turn the car into a different direction/section of the grid. A loop is implemented so that the car doesn't ram into the middle of the longer buildings. This design would still need a lot more work, but it's just an idea. @p0rtalplay3r: you really up-ed your game in terms of schematics ! Very neat. +1 I like this idea VERY much personally. 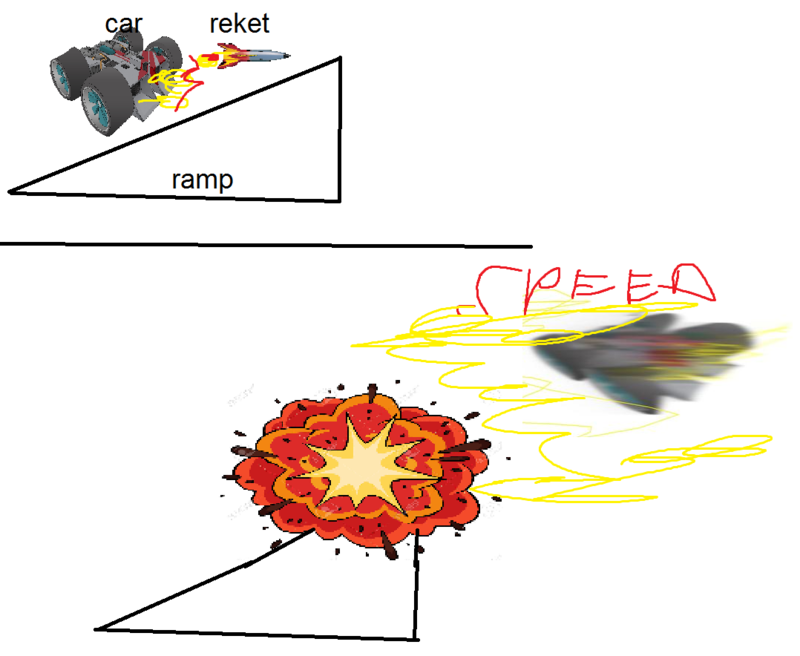 The 2 cons I see is for times when you lose your speed using the ramps: you'd lose grip and fall, reason why I see this concept more as a... track ? Also, you'll navigate a lot to reach your opponent. Queadah wrote: @p0rtalplay3r: you really up-ed your game in terms of schematics ! Very neat. The cars won't loose grip on a vertical surface if they are going at least 40 kph or faster. I guess the city would require a lot of navigation if there are very few players in the arena which could possibly be solved by putting in a lot more turns and fewer buildings, and lastly if there wasn't a ground where would the players start/respawn? p0rtalplay3r wrote: lastly if there wasn't a ground where would the players start/respawn? On top of the buildings . Skyscrapper to drive on. We need this. Dont care about how the track design would be. But this element is just to good to ignore. Would be nice in race and also in Arena. Track could be called Neotokyo. Definitely need some building wall rides on Orbital Prime. Definitely a city track in general Id love. You could race between and go through tunnels between/inside buildings maybe suspended or on street level. Dont need to be jumping over buildings for it still to be really fun. Hopefully by that stage the destructibility is optimised so that you can have more destructible objects on track without a big FPS hit. Would be awesome to have billboards that can be knocked down and even corners of buildings or pillar supports at a lobby/plaza of a building capable of being taken out. That leads me to ask for a whole buildings being able to be brought down but maybe Im going too far? Very, very cool concept. Don't know how well this would work gameplay-wise, but I'm sure Chris can cook up a simple textureless testing map once multiplayer is online. Hmmm...I feel like this would be great for hide and seek for some reason.